Throughout one’s college experience, academic opportunities present themselves and allow for a more creative, enriching, and memorable learning environment. The 2016 Fall semester sparked the first Libratory independent study and provided three students in ENNC 3240 with the opportunity to prepare a twenty-minute presentation on a topic in Victorian Poetry using the Albert and Shirley Small Special Collections Library’s nearly boundless resources and fantastic staff. The system used to find and request specific works from the library is called Virgo, and it proved instrumental as a catalogue of all available works by Robert Browning—the particular Victorian poet I chose. 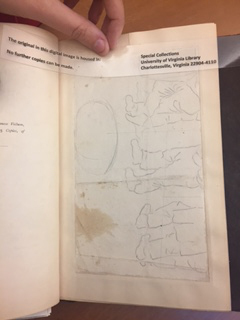 Special Collections happens to hold over one hundred of Browning’s works, which both lengthened the research process and led me to seek additional assistance from David Whitesell, a curator at the library. My only qualm with Virgo lies in the lack of visual representation—with David’s help I could view all of Browning’s work at the same time to identify any underlying themes and to investigate the hidden gems found in the library. What I decided to include in my presentation were eighteen volumes dating from 1835 to 1910, showcasing the many forms and levels of craftsmanship present in these separate works. Some of these differences arose from multiple copies of the same book. By comparing and contrasting these copies, my presentation illustrated the unique nature of these older volumes, as well as the close relationship between reader, writer, and bookmaker which seems to have been stronger in the past than it is today. Original pencil sketch in Robert Browning, Poems (1897), copy 2. Number 119 of 125 copies. I saw many books with personalized details—many of them had inscriptions, while others included letters or sketches. These made each book feel more special and the entire research process more exciting as I knew I would likely find something interesting in almost every one I looked at. The library has 2 copies of the 1897 edition of Browning’s Poems. 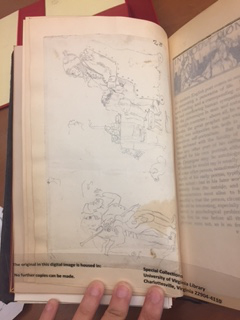 Copy 2 features original pencil sketches, but it also includes a cut and pasted Robert Browning signature, while copy 1 features a leather binding by the Guild of Women Binders with flowers, figures, and words from Browning’s work on the covers. In comparing both copies, I saw a sharp contrast between the amount of attention placed on the outside and the inside, since copy 1 does not include other features in its first few pages and copy 2 has a plain red leather binding with gold accents, in contrast to the detailed leatherwork found in copy 1. Robert Browning, Poems (1897), copy 1. Number 116 of 125 copies. 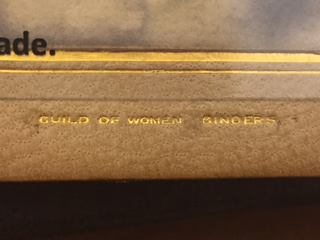 This copy features a binding by the Guild of Women Binders with fantastic leather-work on the covers. I also found books containing letters. In fact, while reading volume 2 of The Letters of Robert Browning and Elizabeth Barrett, I encountered a facsimile on page 567 of a letter from Elizabeth to Robert Browning with a small note at the end directing the reader to page 443 of volume 1. After seeing this note, my curiosity was piqued and I rushed to look at volume 1, but at that point the library was about to close and I could not request any more items. Having to wait until the following day, I requested the book as soon as I could and opened it to page 443 to find: a printed version of the facsimile letter. I found this to be thought-provoking because, although not the first handwritten letter I had encountered, it was the only inter-volume communication I has seen in my research thus far. The Poetical Works of Robert Browning (1868), volume 1. Pasted-in letter from “Louise” to R. H. Collins. This copy reflects an attribute of many of these books in that it was originally given as a gift. Per the presentation letter pasted in the front, “Louise” gifted it as a Christmas present to R.H. Collins in 1868, the year of its publication. 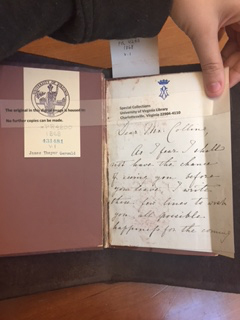 I found this particular book fascinating because it also includes detailed inscriptions written by R.H. Collins—we know they were written by her because she wrote her name after the pictured letter and the other writings are in the same handwriting. In the front of the book she quoted several passages, presumably her favorites, with page numbers. Then, in the back of the book, she wrote what appear to be responses to the text. 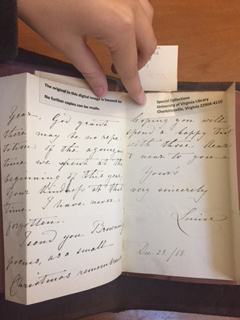 This amazed me because I could see the level of connection she had to this book in her inscriptions and also in the letter which originally went along with the gift. I have seen many amazing books in my research—I have held a first edition of Paracelsus from the McGregor Library, a fully illustrated copy of Pippa Passes, and an original Robert Browning signature—and discovering what makes them unique and powerful has made this experience worthwhile and enjoyable. The process of turning through each and every page can seem grueling at first. However, the more you look the more you will find, and where else can you feel like a detective, a scholar, and a little kid at the toy store all at the same time? Here is the complete list of featured works from my presentation; I strongly recommend visiting the Special Collections Library and requesting these items, or any others that interest you. This entry was posted in Instruction and Outreach, Uncategorized and tagged Andrew Stauffer, Elzabeth Barrett Browning, Libratory, Robert Browning, Victorian poetry by David Whitesell. Bookmark the permalink.